Wandering down St James' Street, just off the Old Market Square in Nottingham a little while ago, I read something that I hadn't thought much about, but which simple concept thrilled me to the core. I came across the 'Up N Down Under Sports Bar'; of course I'd seen this many times, but on the gable end of the building is a notice, giving a little bit of the buildings history. It was this that thrilled me, and set me to thinking about literacy and the working class. To quote from Wikipedia, "Literacy has traditionally been described as the ability to read for knowledge, write coherently and think critically about printed material". The United Nations Educational, Scientific and Cultural Organisation (UNESCO) takes this definition further, saying it is the "ability to identify, understand, interpret, create, communicate and use printed and written materials associated with varying contexts. Literacy involves a continuum of learning in enabling individuals to achieve their goals, to develop their knowledge and potential, and to participate fully in their community and wider society". 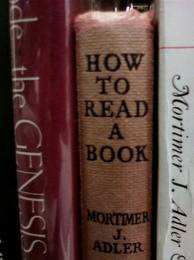 This of course is the ultimate goal, but over the years, people have been satisfied with being able to read and write. The 18th Century was an important period in addressing illiteracy in Europe. It is interesting to note that by the middle of the century, the ability to read and comprehend translated scripture led to Wales having one of the highest literacy rates. This came about because of the 'circulating schools' started by Griffith Jones. One of the differences between non-conformist religion, and that practiced by the established Church, was the belief that everyone had the right to read the Bible for themselves, and not to rely on reading by others. Jones' aim was to have everyone read the Bible for themselves in Welsh (after all, that was the national language). In Sweden, by the end of the 18th Century, the ability to read was nearly 100%, because of enforced literacy on the people. However, in Wales, Sweden and England, the ability to write lagged far behind the ability to read. It is said that "as late as 1841, 33% of all Englishmen, and 44% of Englishwomen signed marriage certificates with their mark, as they were unable to write". European countries were more successful than England in implementing educational reform because, as the historian Ernest Gellner says, "those governments were more willing to invest in the population as a whole". England didn't have government-financed public education until 1870, and even then it was limited. Back to the 'Up N Down Under'. In the mid-18th Century it was known as The Talbot, (not to be confused with The Talbot in Long Row, which since the 1920's has been Yates, or with The Talbot House Hotel in West Bridgford). 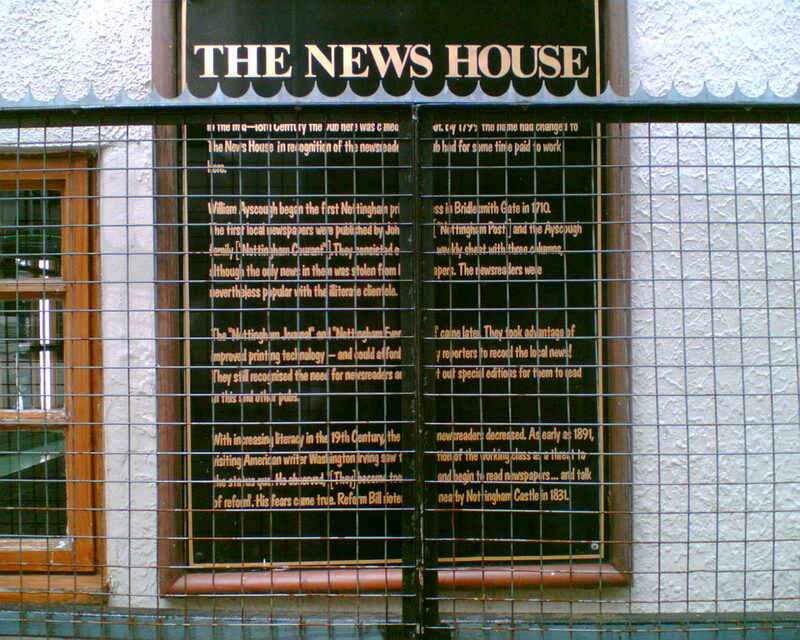 In 1799 the name was changed to The News House (also not to be confused with the current pub The Newshouse situated on Canal Street), in recognition of the newsreaders who had been paid to work there. William Ayscough began the first Nottingham printing press in Bridlesmith Gate in 1710, and before too long the Nottingham Post, and Nottingham Courant were being published. In the early days it was just a weekly sheet with three columns, with news "stolen from London papers". 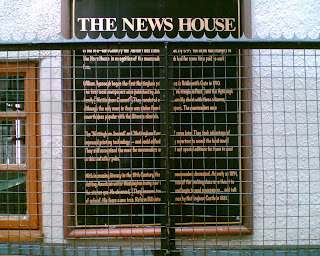 Newsreaders were paid to go to places like the News House and read the papers for the benefit of illiterate clientele. They were very popular. As technology improved, the newspapers could afford to hire reporters to record the local news, but they still put out special editions for newsreaders to read out in pubs. Because of increasing literacy levels in the 19th Century, the need for newsreaders died out. (Interesting how they re-surfaced on radio in 1922, and on TV in 1954). Not everyone was enthused by the education of the working classes. In a visit to Nottingham in 1891, the American writer, Washington Irving saw the education of the working classes as a threat to the status quo. He said, "They become too knowing and begin to read newspapers ... and talk of reform". In this he was right, as in 1831 rioters opposed to the Reform Bill attacked Nottingham Castle. How dare they think for themselves, if this carries on, it will be the end of the class system. If only that were true. In spite of opinions such as Irving's, there was a huge drive in the 18th and 19th Centuries to improve the reading ability, and in many cases, the writing ability of people. There were significant initiatives in the Scottish Highlands, Methodist Societies in England, and the Circulating Schools in Wales previously mentioned. It has been noted that in Wales, between 1737 - 1761, there appears to have been about 3,000 schools with over 150,000 scholars. While the schools were predominantly there to teach children, adults were also welcomed, but this work with adults was definitely seen "as subsidiaries to the teaching of children". The first proper school for adults is said to have begun in Nottingham in 1708 to meet the needs of women in lace and hosiery factories. This was independent of any other organisation and was run by a Methodist (William Singleton) and a Quaker (Samuel Fox). The main focus was on reading the Bible, and then writing from dictation or copies. Over 160 years later the national education programme was introduced by the Government through a system of mass schooling. Literacy teaching outside the formal school setting continued though. In the view of the historian Harvey Graff, the introduction of mass schooling was in part an effort to control the type of literacy that the working class had access to, and that this uncontrolled, potentially critical reading could lead to increased radicalisation of the populace. In his view, "mass schooling was meant to temper and control literacy, not spread it". There was still the attempt to keep the working class down where they belonged, and to know their place. But the working class were not to be kept down, and learning to read brought an appetite to read books for themselves, and the establishment of libraries. There is a long and glorious history of working class libraries, even though working class people had to fight through paternalistic provision before they got what they wanted. I've just been reading a fascinating lecture given by Peter Hoare in September 2009, called, "Mechanics, Artisans, Operatives, Labourers and Others", which is about libraries for the working class in 19th Century Nottinghamshire. This is worth a blog on its own, which I may return to sometime, but for now let's just take a peek at the battle for control of working class libraries. Members of the Chartist movement in the 19th Century, such as William Lovell, "made intellectual freedom their first political priority, calling for adult education programmes and public libraries governed by the workers themselves". This is one of the reasons why I love the Chartist movement so much, in an age when we take 'intellectual freedom' for granted, they had to fight for it. Peter Hoare points out that creating institutions such as the Mechanics and the Artisans Institutions were essentially 'top-down' institutions, run by the town's elite to improve the conditions of the working class. He saw this as an exercise in social control, as the book-stock was carefully monitored. The Founder of the Workers Education Association, Albert Mansbride, had particular comments to make about the Mechanics Institutes. To him they "were largely the result of philanthropic effort, set on foot by some local magnate, rather than upon the initiative of the mechanics themselves". 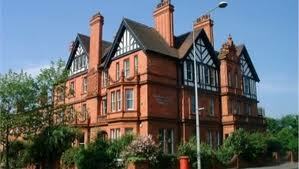 Nottingham and district had these institutions (libraries) that were heavily influenced by the clergy. The Radford Artizans' Library was founded in 1837, and in its rules it states, "No works opposed to pure morals, or to the great doctrine of justification by faith alone, or of the divinity or atonement of Christ, shall be admitted". Though Peter Hoare says that a few dozen novels were stocked. This selection policy was not universally appreciated, and in August 1835 half a dozen members of the Radford Artizans' Library broke away and formed the first Operatives Library in Nottingham. How did this come about? They wanted to read, "Popular History of Priestcraft" by the radical Nottingham writer William Howitt. The committee refused, with the members breaking away; subscribed a small sum each to buy the book themselves, leading to further purchases and a growing list of borrowers. This new Operatives Library, based in the Rancliffe Arms, was totally democratic, had very low subscription rates and all decisions were in the hands of the members. Before long, other similar libraries had been formed in the working class suburbs of Sneinton, Radford and Hyson Green. Seven of these libraries formed a co-operative, and were numbered 1 - 7. Exercising intellectual freedom, their rules showed how broad thinking these libraries would be. The first rule states, "As we believe, no political institution ought to stand that cannot bear examination, and no creed ought to be believed that cannot bear discussion, we, therefore, resolve to purchase works of every description, political, as well as those embracing history, science and literature". Unfortunately for the working class in Nottingham, in the end it was the paternalistic and socially controlling Mechanics that survived, while the Operatives disappeared almost without trace. However, this was not necessarily the case in other parts of the country. Working class libraries across the country existed long before the advent of public libraries. Some of the first working class libraries in Britain were The Leadhills Reading Society (1741), the Wanlockhead Miners' Library (1756) and the Westerkirk Library (1792). In lowlands Scotland, one of the first true public libraries was thought to be the Innerpeffray Library in Perthshire. 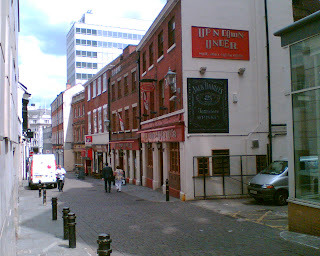 Working Men's Clubs, Pubs and Co-operative Societies also contributed to mutual education. By 1903, 500 out of 900 Working Men's Clubs had libraries, with a total of around 187,00 volumes. Miners libraries in the coal fields of South Wales made exceptional efforts to support their own libraries right up to the middle of the 20th Century. One commentator has said, "When public libraries were established, they were used by some working class people, but this was never a mass activity. Working class people who used libraries were the exception rather than the rule". I'd be interested to know the demographics of library use today, to see if this situation has changed. There is so much opportunity, that I really hope it has. But what of literacy today? It is not a good picture throughout England and Wales. When you think about what our forefathers went through to be literate, it is nothing short of disgraceful that we are in the position we are in in 2011. In May this year, The London Evening Standard launched a literacy campaign to "Get London Reading". Though their statistics were for London, they bear comparison with many other parts of England and Wales. I spent many years working with prisoners and ex-prisoners, and I agree with a recent study by the Prison Reform Trust that found 48% of inmates have the reading age of a seven year old or younger. When the Westfield Stratford City shopping centre was recruiting for staff earlier this year, the Director was horrified by the educational standards of job applicants. The Director comes from Australia, and he could hardly believe that so many British young people have left school "functionally illiterate and innumerate". They had to bring in tutors for the people they thought might make it because their enthusiasm levels were high. The Standard provided these statistics for London. We don't need to go on. The problem throughout the country is a big one, and not being an educationalist, I struggle to understand why. I do understand however the facts. Achieving literacy levels as per UNESCO's definition seems a million miles away; we'd settle at the moment for confidence in reading and writing. If it was possible to turn in your grave, that would be happening with our working class forefathers who fought so hard for intellectual freedom through schools and libraries. What has to be done to reverse this appalling situation? Over to you educationalists. "Literacy is not a luxury, it is a right and a responsibility. If our world is to meet the challenges of the twenty-first century we must harness the energy and creativity of all our citizens". "I'm not superstitious, but ..."
"Where am I to go?"